Lucy's love for squirrels is only rivaled by her love for one thing. Mind you, if you are a member of this family, it is a requirement to love Star Wars. 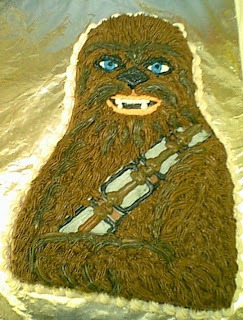 But honestly, I never really thought I would be planning a Chewbacca birthday party. I am going to do my best to give her Chewbacca. But then I started searching Google for ideas. I am not making this cake. But if I did for sure I would make an appearance on Cake Wrecks. Jason will not wear this costume. Janey will not be wearing this one either. I personally am not a fan of hairy legs. I could make these for favors. I am pretty sure she would love me for forever and eternity if I got her this backpack. A backpack that is probably bigger than her whole body. 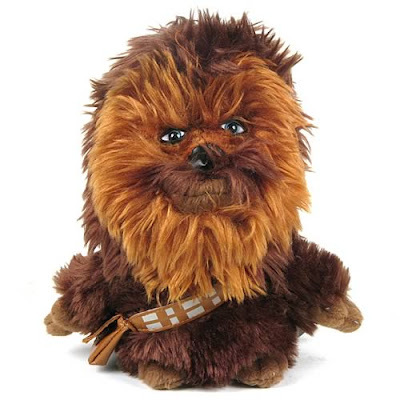 But instead I will get her this little Chewie. Because all she has asked for is a cozy Chewbacca that she can cuddle. Back to the Google for the rest. oh my goodness. ha-ha-ha-larious! 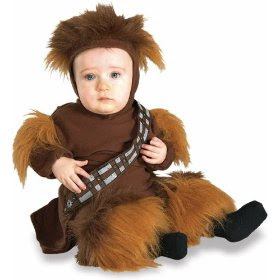 can't wait to see how you make chewbacca look cute. Our doggie does the BEST Chewbacca impression... I think it looks like it could be an opportunity to make it your own FUN chewy party! FYI, Lego makes the CUTEST chewbacca, might be worth a visit to ebay? okay...so Henry got some star wars bath toys (they're really cute!) and plays with them all the time. this morning, i thought: 'hey, do you want to watch star wars on the tv? '...but see, while my husband did, in fact, campout for the recent SW movies, i have NEVER, NEVER, NEVER seen a single one...so I had to google which one of the DVDS we had was the "first/original" one! oops. totally funny! I once had to do a Jar Jar birthday. I made a cheesecake (requested by my then 6 year old)...and "painted" Jar Jar on with food coloring. It turned out okay. I'm so glad I didn't need to track down a cuddly Jar Jar. That would've been a challenge! I'm sorry but that stuff is freakin' hilarious! I mean really, do people actually buy/make it?!? That is awesome! I love Chewbacca too! 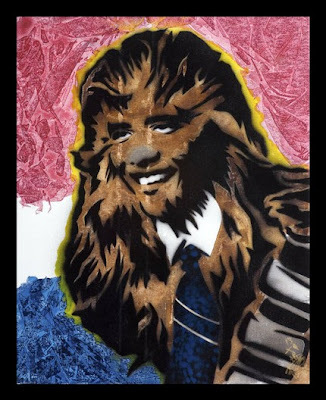 My sister used to have a crush on Chewbacca when we were kids. We would play Star Wars and I would claim Luke as my boyfriend and she would claim Chewbacca. Love cake-wrecks! I can't say I appreciate chewie or star wars being that I've never seen it, but I'm told by my husband that our choc lab sounds like chewbacca. I don't know much about SW but is there a 'girl' chewbacca? You could bling her out with one of your messy flower headbands and 'OMG-so-cute' necklaces:-) YOU wouldn't stick to all brown, would you? ... No matter what, she will LOVE LOVE LOVE you forever for doing this for her! That is super funny, I can't wait to see what you come up with along with all the pictures from her Chewbaca party! um... yeah... good luck with that! I am laughing... am I allowed to laugh! =) OH... I have a Star Wars cook book... I will look up the Chewy Cookies!! ;) They are called Wookie Cookies! So funny... They also have Tie Fighters (hot dog pieces in dough) and Jedi juice pops... light sabers! clever! Princess Leia Danish - funny ! Yoda soda (its green) ... you could make a swamp cake and put figures on it?!! I am done! I love planning birthdays! =) Have fun planning! i don't know...that cozy chewy is all cute except for the eyes. their a bit creepy. 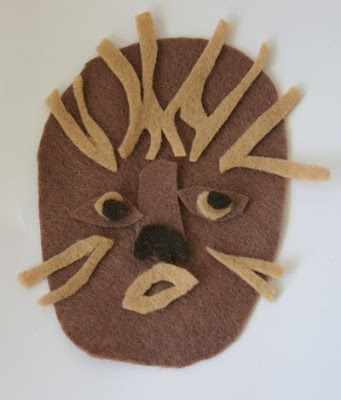 i might gouge those out first, pop in some cute little felty eyes with beautiful lashes, then give them to her. but then again, kids don't care about the eyes. or body hair, apparently. whatev. you're still, like, the coolest mommy for running with this! He is awfully snugly, isn't he...as a toy. Maybe not so much as a cake. I'm just not sure how I would feel slicing into Chewy's head and serving him up with ice cream. Can't wait to see how you fancy him up for the party!! Wow. That is all I can say. 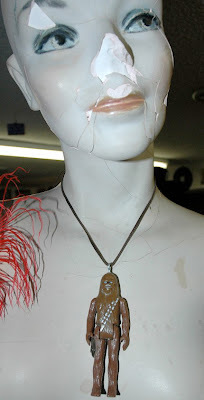 Those are some pretty intense Chewbacca party items. Glad you were able to find the last. That actually does look friends and cuddleable(is that a word?). Good luck with the birthday party. 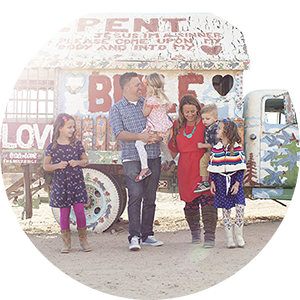 also, i'm posting your button on my blog, can you do the same with mine or follow my blog and help me get more international friends? OMG, this is too funny, I think I almost peed myself...hahaha! god bless her little heart, but i think i'm going to have nightmares. HYSTERICAL! I'm sure whatever you pull together will be fabulous! Great post. I was cracking up. Have fun with that party. You could even make some sort of "chewy" cookie for the party! Miss Lucy sounds like such a quirky little thing! I'd love to meet her and talk with her awhile. Happy Birthday! My husband's nickname is Wookiee. We have a Star Wars room in our house. Ewoks are my favorite (and in my favorite episode). I even have an apron to prove it. Your daughter must rock (like you)! My 3 year old son wanted a kitty party one year....try finding masculine kitty party decor...ebay saves me every time but it was rough! i actually think janey does need that costume. Can't stop cracking up. Soooo funny! She's awesome. That is GREAT!!! 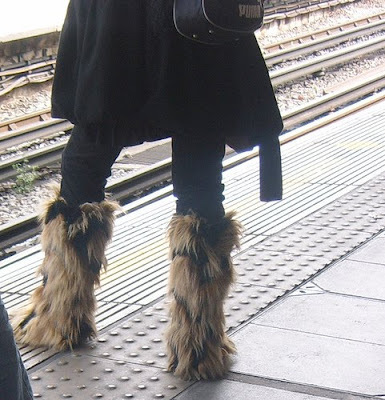 I definately like what you settled for, although, the backpack is awefully amuzing!! Hope the party is awesome!! Wow. Who knew all those items even existed? Thanks for a great laugh! Don't de-friend me, but.....I have never seen Star Wars. 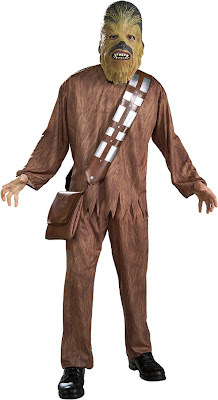 And, after seeing that scary chewbacca stuff, I dont think I want to. yikes!!!! 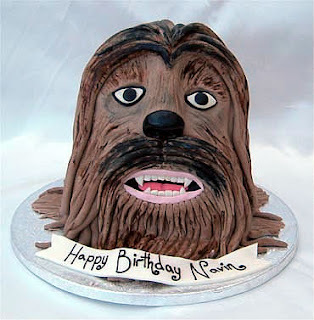 I have to laugh because I had that Chewie cake for my 8th birthday. I also dressed as Princess Leia (how the heck is that spelled anyway) for my party. You would think I was a huge fan, but in reality my ant took me to see the movie and I pretended to like it so I wouldn't hurt her feelings. One big ole Star Wars party and an xwing fighter and many action figure gifts later and the secret has not been told. I don't know if you're interested but this lady is based out of Mission Viejo. It's a whole lot easier then making them yourself! I made a Chewbacca cake a few weeks ago and it was TORTURE! I think it ended up looking more like an ugly lion but the mom told me her son really liked it.